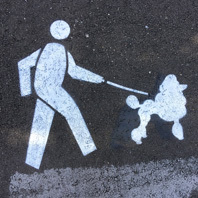 We reported in our December 2013 newsletter that a street artist had gone over Rec & Park’s standard stencils of a person walking a dog on leash with their own stencils of dogs of varying breeds. Rec and Park never removed them. 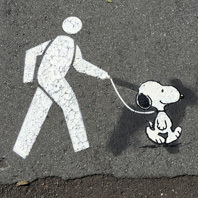 The original stencils were designed to remind dog owners to keep their dogs on leash on the park’s pathways. 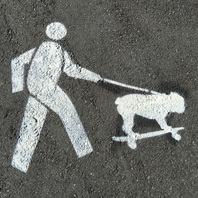 That street artist is back in the park with some new humorous stencils, shown below, and include: a poodle, Snoopy, a Keith Haring dog, a cat, a dachshund, a corgi, and a dog on a skateboard. 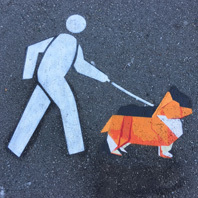 The artist identified himself on Hoodline as fnnch and also tweeted that he had “repainted all the dogs in Duboce Park” in a Facebook posting. He was interviewed in a November 2014 article in Hoodline http://hoodline.com/2014/11/here-today-gone-tomorrow-alamo-square-s-ladybug-art?utm_source=story&utm_medium=web&utm_campaign=stories and was featured in a June 1 Chronicle article http://www.sfchronicle.com/art/article/Street-artist-avoids-being-overtly-political-to-6300481.php?t=414a75df771210a92f&cmpid=fb-premium. 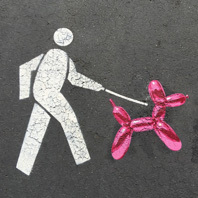 While these stencils are technically illegal graffiti, they are humorous reminders to dog owners to keep their dogs on leash on the park’s pathways. 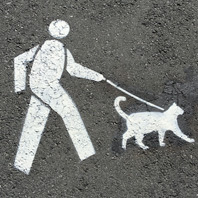 Interestingly, a few neighbors have complained recently about official stencils that reference dogs on leash as being faded and difficult to read. 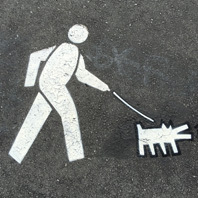 The street artist’s work also appeared briefly in Alamo Square Park as a line of stenciled lady bugs but were removed after a few days. Other samples of his work can be seen on his Instagram page.